Week three of our 52 week photo challenge had us interpreting the theme in two different countries- Singapore and Shanghai. What does the colour red mean to you? It is a colour that we see every day, in traffic lights, road signs, logos, fire hydrants, and the list goes on. I was being chased out of a bank foyer by a security guard when I shot this one. 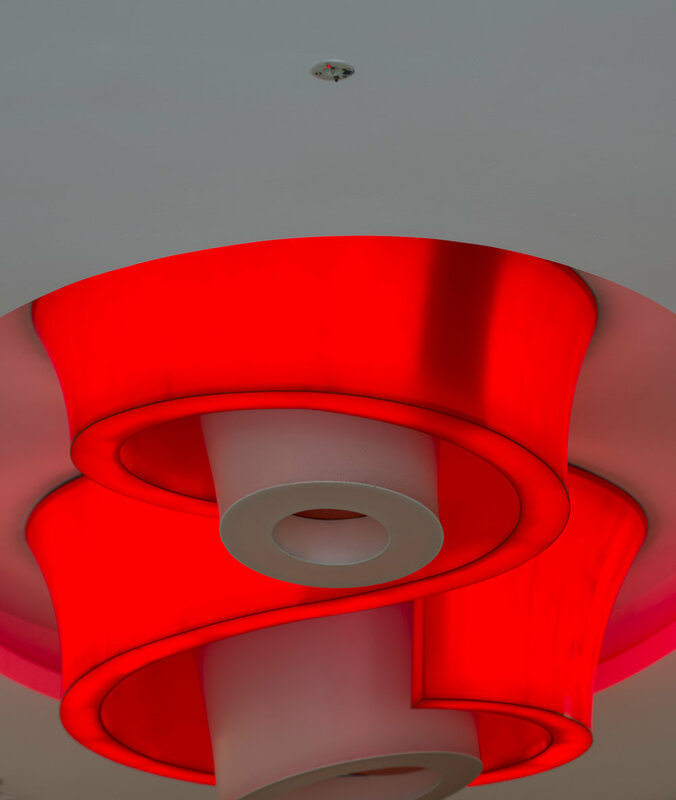 I couldn’t resist the neon red colour in the curved shape. Depending upon where you’re from, it could mean power, dominance, warning, energy or passion. In Chinese culture, Red symbolises good luck and is the preferred colour for brides. Case in point, the outside portico of a hotel in Singapore, preparing for Chinese New Year. The lanterns are so vibrant and the wind created some movement in the tassles, which I think is preferable to them hanging still. This photo was shot in the early morning soft light. In the less intense light the usually bright red colour of the marker became a much softer red tone. As humans we all associate the colour red with blood. Did you know that when butchers display meat they often add something green to the case or package? That’s because green is opposite to red on the colour wheel and it diffuses the intensity of the colour red, therefore making the meat look less gruesome and psychologically more appetizing. Another image taken in the early morning light, so the red is not as vibrant as it would be in bright light. I wanted to show the red pattern on the tape as an abstract element against the blocks of colour in the background. This was lots of fun to shoot because I intentionally wanted no focus, just the effect of the red lights through the big lens. It was actually quite difficult trying to override the camera settings that usually only release the shutter when focus is set. But with a bit of fiddling, it happened. I particularly like this one because it is more abstract or conceptual. 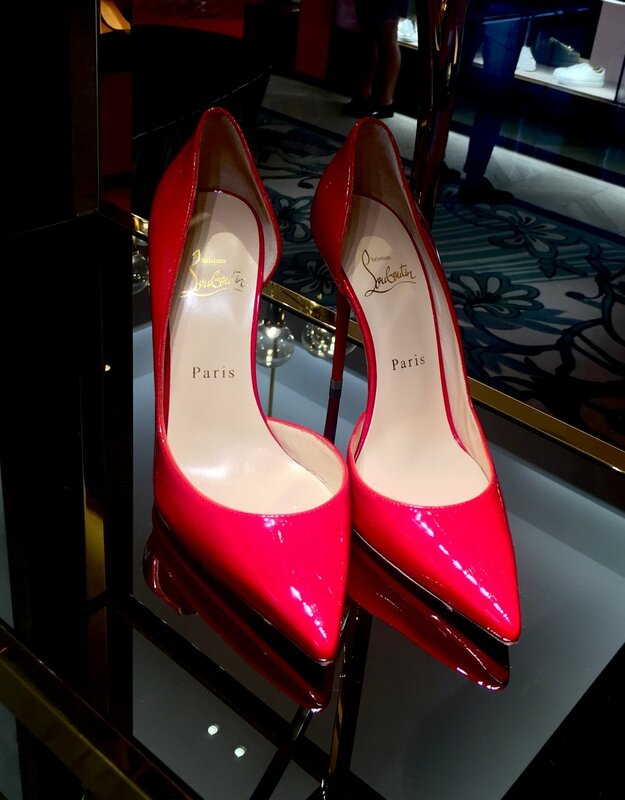 Nothing like a pair of beautiful Louboutins to symbolise the Red theme. A gorgeous shot taken on an early morning walk in Shanghai this week. 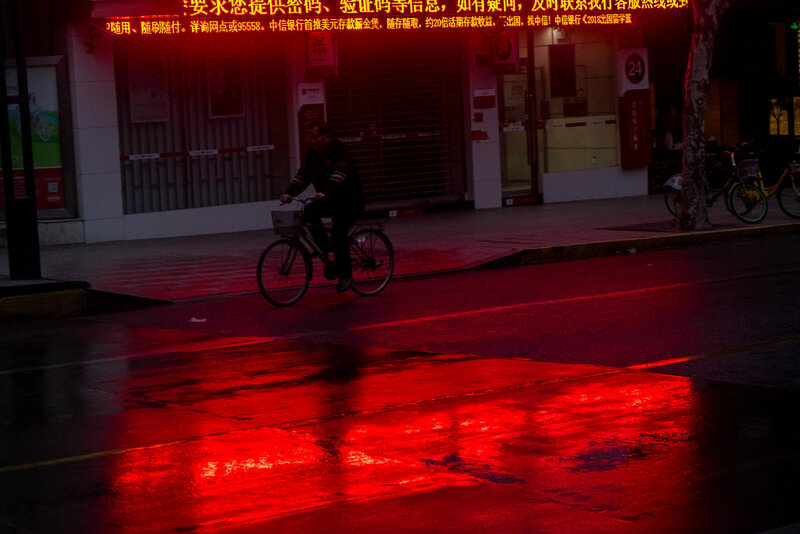 Sean has taken advantage of the wet roads reflecting the red neon at the top of the image. The two bands of red colour on the top and bottom of the image, frame the bike rider in the centre. It is strangely dynamic and calm at the same time. The dusk/ dawn or the golden hour is great for subtle colours because the light is less intense. How would you interpret the colour red?